Outline/Chart view. Right click icon of selected item(s). Map view. Right click prototype tab of selected item(s). It will pop up a menu of prototypes available in the current TBX. Selecting a list item will assign that prototype to the current note. If the current TBX has no prototypes the list simply contains the item 'none'. The selected choice is applied to all selected notes, if more than one. 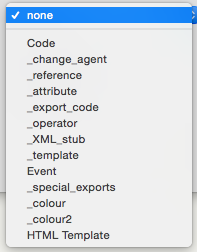 The items in the list are sorted in order of $OutlineOrder value. The list includes both prototypes in the default '/Prototypes' container and any created elsewhere in the document. To re-order the list simply arrange the prototypes' $OutlineOrder accordingly. If all prototypes are in the /Prototypes folder, you can set the Sort order for that container to automatically sort the list to your desired list order.